I have never been to China. Though I would like to go and visit (after all, they have thousands of years of fascinating history) I will probably never get the opportunity. So, then, you may ask, just how do I justify some self-proclaimed expertise in Chinese cooking? I don't! First off, Chinese food we typically see in the United States is not authentic. I know that I didn't break any new ground with that statement but it should be remembered that what we do see is Chinese style food adapted to the available food stuffs and the prevailing tastes of the American public. I would guess that the typical Chinese food then is really "Chinese style food ala Americana." And, if you consider it that way, then you realize that we have a rich, long-standing culinary tradition that has been adapted just for us. We are fortunate, indeed. We get to sample and learn, savor the exotic flavors, before deciding if we wish to delve deeper into authentic dishes or remain with the Americanized form. So then, I would say that I have a good appreciation of the Chinese food we see in the Chinese restaurants and store-front Chinese take-out emporiums. I grew up during the fifties. That was in the declining hey-days of the China Towns across America. It was a frequent treat to go to dinner in China Town. We would stroll the streets and take in the sights, sounds and smells. Passing shops, with brass figurines and highly carved dark-wood furniture, gayly colored paper lanterns and countless curios, there was the smell of exotic woods and incense. Near the doors of the restaurants there was the smell of garlic, onions and ginger and the smell of stir-frying chicken and pork. The high walls of the two sides of China Town faced each other across a busy street. The high walls of the buildings, with their pagoda roofs, mimicked the Great Wall of China. Inside the arched gateways was the carp pond with thousands of shimmering coins on the bottom. There were shops of every description and dozens of restaurants with their menus prominently displayed to lure the prospective diner. It was there, in China Town, that I first started to learn about Chinese food (ala American, of course), about what I liked and just as importantly, what I did not like. Inside, the restaurants were seemingly all alike. It was red and black lacquer with gilt trimmings and dragons. Chinese folding screens made a warren of passages so that large and small groups as well as couples had their own space. In almost all of the restaurants, there was a small raised stage nesting along a wall near the cocktail lounge. On the stage was a polished piano, usually a baby grand. In the evenings, there would be a tuxedo-clad piano player who seemed to know every song the patrons requested him to play. Over the course of the night, the jar on the piano would fill with coins and wadded bills. When you walked in the door of the restaurant, the hostess, dressed in a Mandarin-style dress with long slits up the sides, would show you to your table. Any number of waiters, with black tuxedos, starched white shirt fronts and red cummerbunds, a small white towel draped across the arm, would see to your every need. They brought pitchers of iced water, pots of steaming green tea and those little tea cups without handles. It was a long process to select from the menu. The list of entrees was long and filled with exotic names but not quite enough description to dare you to try it. In the end we usually ordered the numbered dinner, you know, "...with four you get eggroll," with all of the dishes you already knew and liked. First came the appetizers. And, remember, they were served with a silver-dollar sized saucer of spicy ketchup with a dollop of bright yellow mustard that would make you sneeze. As a youngster, I could never figure out why the fried shrimp, the barbecued ribs and the eggrolls were only appetizers and not a featured dish. As appetizers, they were small portions and all too quickly gone. Next came the featured dishes. The waiters, with double spoons between their fingers, filled each plate with selections from the pedestal dishes and then recovering the dishes with their little metal covers to keep the food hot.. From those early childhood experiences with restaurant-served Chinese food, I developed opinions about what different dishes should look and taste like. Although the public had developed a taste for Chinese food, in the latter fifties China Town came upon hard times and the restaurant clientele dropped off. The luster of the gilt tarnished and the black and red lacquer faded. Even though the public no longer drove to China Town, they frequented the proliferating storefront Chinese take-out shops. I was among those who frequented the shops. Now I could watch the cooks prepare the food, to my order, right in front of me. I could watch the cooks stir-fry the vegetables and meat in those giant woks, fry the shrimp and eggrolls in vats of sizzling oil, watch them scop, toss and turn in a well-rehearsed routine. Then with a flip of the chan, the food was scooped into the familiar take-out cartons with the wire handle and placed on the counter in front of me. These experiences, together with earlier restaurant experiences, reinforced my opinions as to what the food should taste and what it should look like. And by then, I had a pretty good idea of the techniques I would need to master in order to make it at home. Chinese style cooking is very adaptable. It is very easy to mix, match and adjust the ingredients to fit the available food stuff (and that may be the most authentic aspect of Chinese food Americana). You simply add a little more of this and less of that and season it with this instead of that. It is so easy, in fact, that it creates a slight problem. For a given Chinese dish, there are so many variations that is near impossible to cite the defining recipe. Although I give a formal recipe for a chicken chow mein and a beef lo mein, you can certainly mix and match from the sample ingredients listed at the end. So then, what does makes a chow mein or a lo mein just that? 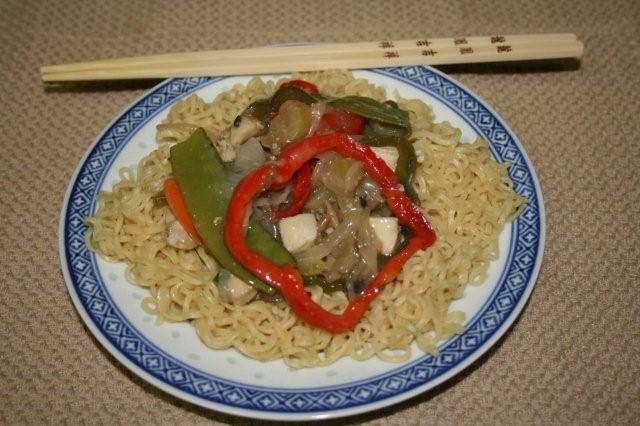 As a general rule, I regard chow mein as having fried, crisp noodles and is finished with a glazing sauce. I regard lo mein as having soft or cooked noodles and is finished with a thickened gravy (and if you serve it over rice, you can call it chop suey). Also, I generally prefer to have lighter green vegetables with chicken, shrimp or crab. I prefer to use the dark-green vegetables with beef or pork where the stronger, sometime bitter flavor wont override the flavor of the meat. Place bean sprouts in a large bowl. Cover with cold water and lift and wash the sprouts. Drain into colander and rinse under running water. Set aside to drain well. Trim scallions, slice thinly on the diagonal including the green stems as well. Set aside for garnish. Select carrots for long, uniformly round specimens. Peels and slice thinly on the diagonal to make oblong slices. Peel onion. Cut off stem and root ends. Cut into 1/4-inch slices. Stack slices and cut once through the middle and separate to make half-round pieces. Trim and string celery, slice diagonally to make crescent shaped, 1/4-inch thick pieces. A green pepper can be used but the red makes for a nicer color contrast and presentation. Cut off top and bottom of pepper. Remove stem from top. Remove membranes and seeds from all pieces, wash and drain, Cut top and bottom pieces into bite-sized pieces. Slice down through center section and unroll and lay flat. Slice in 1/4-inch pieces and then cut pieces in two lengthwise. Wash and trim broccoli florets. The florets can be cooked by stir frying in the wok but I like to steam them until just crisp tender and then set aside. When the completed dish is almost done, fold in the florets to coat with the glaze. Place the chicken breast halves flat on a cookie sheet. Cover with plastic wrap and place in the freezer until the meat is firm to make cutting easier. Slice the breast halves into 1-inch wide strips. Then cut the strips at ½-inch intervals to make ½- x 1-inch pieces of chicken. In a bow with 2 tablespoon cornstarch, add 2 tablespoons of the chicken broth, 1 teaspoon of soy and 1 teaspoon of hoisin sauce. Mix well to make a slurry. Set aside. To a hot wok, add 2 tablespoons of canola or peanut oil. Add chicken pieces and stir fry until cooked through, about 2 minutes. Remove from wok and set aside. Add mushrooms and stir fry until cooked through. Remove from pan and set aside. Add additional tablespoon of oil. Add carrots and celery and cook, stirring, for 3 minutes. Add onions and Bell pepper and cook, stirring, another 3 minutes. Add bean sprouts, water chestnuts and pea pods. Stir well to combine ingredients. Season to taste with salt and pepper. Add chicken broth, cover and steam 3 minutes. Remove cover and cook until broth reduced to 1/4-cup. Add chicken, mushroom and broccoli florets. Add cornstarch slurry and stir constantly until glaze is formed and all liquid is absorbed. Remove from heat. 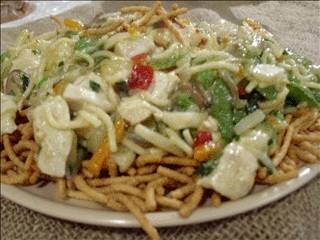 On serving platter, arrange prepared chow mein noodles in a layer with a slight hollow in the middle. Spoon cooked mixture over noodles leaving a dry border of noodles. Sprinkle with the reserved sliced scallions and the toasted sesame seeds. Place round steak on cookie sheet and cover with plastic wrap. Place in freezer until firm but not quite frozen. Trim any excess fat but leave a bit to render and flavor the pan. Slice at an angle to shorten the grain. Cut into 1/4-inch strips. Cut strips in half to make pieces 1 ½- to 2-inches long. Place strips in a stainless steel or glass bowl. Add black pepper, sherry and soy sauce. Toss to coat. Cover and set aside. In a large bowl, cover bean sprouts with cold water. Lift and separate bean sprouts. Pour into colander and rinse with running water. Set aside to drain dry. Peel carrots. Place carrot flat on cutting board. With peeler, carefully run peeler along the entire length of carrot to make long strip. Discard first narrow strips. Continue until carrot has been "peeled" into wide, curly strips. Set aside. Trim Bok choy ½-inch above base, hold leaves in original shape. Cut through, from top to bottom. Turn head 1/4-turn and cut, top to bottom, again. Cut across head to make ½-inch strips. Set aside. Trim and string celery. Cut on an angle to make crescent-shaped pieces. Set aside. Peel and trim top and bottom from onion. Slice into 1/4-inch slices then cut once through stacked slices to make half-round pieces. Set Aside. In a small bowl, mix 2 tablespoons of the broth, cornstarch and oyster sauce. Stir well to mix. Set aside. Stir again just before use. Cook noodles to package directions. Drain, rinse and set aside. In a hot wok, add a dollop of butter. Add mushrooms and stir fry until cooked through. Remove to plate and reserve. Add 2 tablespoons of oil to wok and add reserved, marinated beef strips. Stir fry until no longer pink. Remove to plate and reserve. Add 2 additional tablespoons of oil to the pan, Add celery and carrot strips and stir fry for 3 minutes. Add onions and stir fry for another 3 minutes. A Bok choy and bean sprouts and stir fry until heated through. Add remaining broth. Bring to a boil, reduce heat to simmer, cover and cook until vegetables are tender. Increase heat, add reserved mushrooms and beef. Add cornstarch mixture. Cook and stir until heated through and thickened gravy has formed. On serving platter, place noodle, filling plate to edges. Make hollow in center. Ladle cooked beef mixture into hollow in noodles. Garnish with sliced scallions. Whenever I pass a shop where they serve or make Chinese style food, I still take a look to see how they do it. On several occasions I have seen baby corn as one of the chow mein ingredients. I have developed a personal bias against the baby corn and have not listed in the samples above although you may choose to do so. It is just too far removed from the Chinese food I learned to love a half century ago.